Rain boots, galoshes, wellingtons… an invention of Arthur Wellesley! Fry, William Thomas. 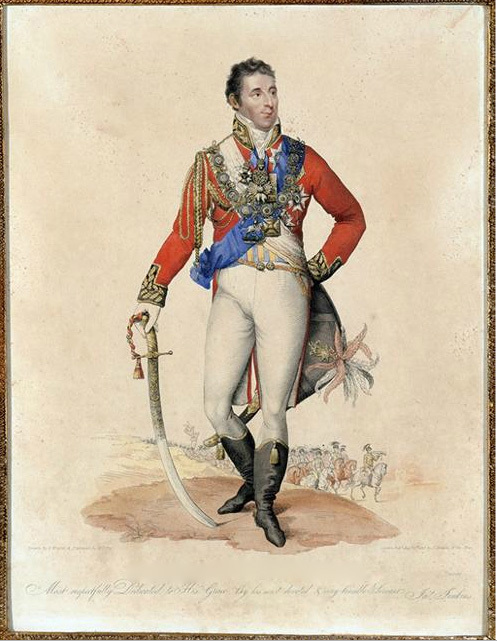 Portrait of the Duke of Wellington, 1815. Color engraving, 50 x 40 cm. Image from Réunion des Musées Nationaux, Art Resource, New York. According to the Victoria and Albert Museum, “Wellingtons first appeared at the time of the Napoleonic Wars, when the army became more socially visible and military costume influenced fashionable dress. Another boot with military links was the Blucher, a laced boot named after the Prussian General Gebhart von Blücher, who played a decisive role alongside Wellington in the Battle of Waterloo in 1815” (2). Arthur Wellesley, the Duke of Wellington, is a well known military hero, politician and womanizer. On the evening of his most famous military victory, The Battle of Waterloo, he wrote the following: “It has been a damned nice thing – the nearest run thing you ever saw… ‘I never took so much trouble about any Battle and never was so near being beat” (1). This victory brought him success and recognition, and apparently, some sartorial admirers. According to legend, the wellington boot is a variation of an 18th-century Hessian military boot. Sometime after the Battle of Waterloo, Wellesley directed his shoemaker, Hoby of James’ Street, to create a boot more suitable for the newly stylish trousers. This new, tailored boot still rose to the knee, but the new slim cut, sans trim, fit suitably under the trouser leg. 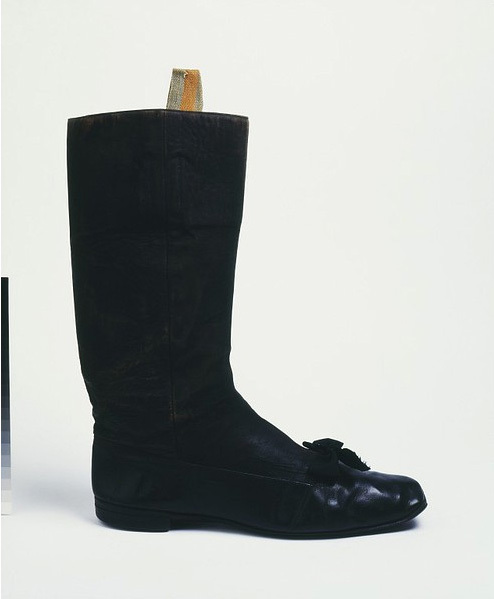 Made of calfskin, the boot was nicknamed the “wellington” and men in Wellesley’s social circle, the gentlemen of England, soon adopted it into their wardrobes, possibly seeking to emulate the famed war hero. In The Whole Art of Dress, a book published in 1830, a cavalry officer cites the origins of the Wellington: “This boot is invented, doubtless, for the mere purpose of saving trouble in dress; for without attending to silk stockings or the trouble of tying bows, you have merely to slip on the boots and you are neatly equipped in a moment” (2). As the wellington gained popularity, new versions of the boot were created, including the dress wellington, a style suitable for evening. Dress Wellington, c 1840. Black leather, with suede leg and silk bow, hand- and machine-sewn. From the Victoria and Albert Museum. Sexton (lithographer) Dix, W. (printer). 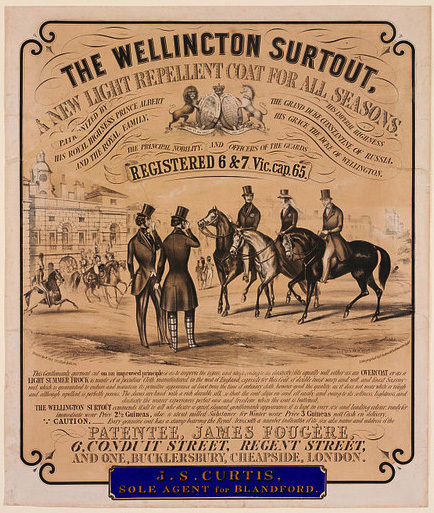 Poster, The Wellington Surtout,1845. Tinted lithograph printed from two stones with added hand-lettering. From the Victoria and Albert Museum. According to the museum, “This early example of a lithographic poster advertises a men’s raincoat. It depicts a young Queen Victoria and Prince Albert accompanied by the Duke of Wellington riding past Horse Guards, invoking royalty and celebrity to sell the product…. The poster includes descriptive text extolling the technical qualities of the raincoat. The Wellington Surtout appears to be a successor to the 18th century water-repellent ‘hard’ tartan overcoats. It may have been a more stylish alternative to the coats made from rubberised cloth invented in the 1820s” (2). After the 1840s, wellingtons continued to grow in popularity, changing from calfskin to rubber. This practical, waterproof design brought the stylish boot back to the battlefield, where soldiers wore wellingtons in the wet and cold trenches of World War I and in inclement weather during World War II. The boot remains a wet weather classic, appearing intermittently in fashion magazines throughout the twentieth century. A few years ago, wellingtons again became a fashionable rainy day necessity; especially prized were those bearing the Hunter label. So, lest you falsely believe that the marriage of celebrity and fashion is a recent invention, remember Arthur Wellesley — politician, womanizer, military hero, celebrity, and fashion plate. He is just one of many! This entry was posted in Mystery Mondays and tagged 19th Century Fashion, mystery monday. Bookmark the permalink.